Daisy Mae King was presented to the hospital on emergency on the morning of 6-22-99. She had been hit by car at low speed 20 minutes earlier. Her gum color was a little pale and she was breathing a little hard but she was fairly stable. We started therapy for shock and proceeded with the normal physical exam we try to make ourselve do on each trauma case. Her "long bones" all appeared to be OK and no spinal pain was identified. Minimal abdominal pain was identified and her color improved with fluid and corticosteroid administration. During the exam we noted that the lung sounds on the right side of the chest were a little dull. 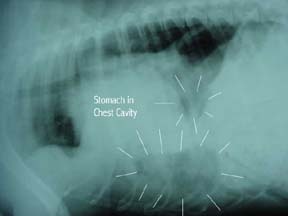 We admitted Daisy for observation and noted that we should probably get some chest films to make sure that the diaphram was intact and that pulmonary contusions or pneumothorax was not present. We were able to get chest films without undue stress for Daisy. I must say I am thanking my lucky stars that I did not try to skimp on the chest films. As can be seen on the "x-rays" the contrast between the abdoman and the chest is lost and abnormal gas filled structures are present in the chest. Daisy was very stable until surgery was performed the next day. It is scary that she was so stable. She was in fact bright, active and bouncy until the premeds were given. At surgery a 180 degree tear of the entire right side of the diaphram from it's attachment to the chest wall was present. It was a challenge to close. Surgery on the diaphram is complicated by the fact that we are working with an open chest . 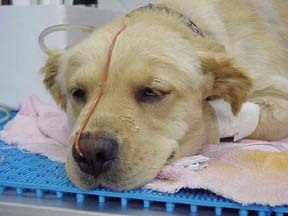 . . thus we have to use ventilation since the patient cannot exchange air on it's own. We were thankful that one of our "old hands", Nancy Graybeal, was there to advise our temporarily depleted staff and Sonia Little assisted with the surgery. 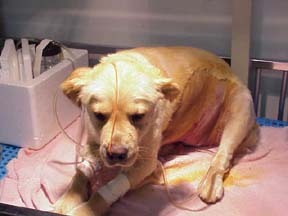 We were pleased with the surgery and Daisy is shown in these pictures in the recovery cage. As we have mentioned before we do use a lot of intranasal oxygen with cases such as Daisy. This takes a lot of the load off of Daisy's partialy deflated lungs. Sometimes we install a chest tube in these cases and sometimes we don't. The decision to use one or not depends on a lot of factors. If lung leakage or fluid accumulation is expected we should use one. However, they can also be a source of problems themselves, especially if one fails and it is not recognized. Since our staff is so stretched thin right now I decided that the chest tube might not be watched as closely as we might wish. I felt that the risk of lung collapse from natural causes would be more likely to be recognized in time since it would usually happen more slowly and we did not install a chest (drainage) tube in this case. Daisy experienced some post-operative nausea but was bright otherwise in the evening following surgery. We continued intranasal oxygen over the first night at decreasing flows until the following morning when Daisy seeemed to be able to breath easily without supplementation. We were somewhat concerned about inflammation of the abdominal organs including the pancreas associated with the surgery and withheld food until late the following day. We saw a poor appetite once we offered food but Daisy was bright and alert. We force fed a small amount of food. We saw no vomiting so we felt more comfortable with Daisy's condition. Daisy's appetite returned that evening and we sent her home on 6-25 with instructions to limit activity for about 3 weeks. Daisy was active and eating well.